I rode a train to Chicago on New Year’s Eve (I do love being on a train and seeing our towns and cities through the lens of a railroad car window) and had the opportunity to spend 4 hours reading Rob Bell’s book How To Be Here. As we begin 2019, I found his big question of the book haunting me - What are we here for? Maybe you are wondering this question as you reflect on the ending of one year and the entry into another? In the book, Rob shared the experience of writing his first book and staring at a blank word processing document and feeling anxious with the blinking line in the upper left-hand corner. He wasn’t prepared for how intimidating that blinking line would be. That blinking line of the blank page was taunting him. As he talked about staring at a blinking cursor, I could feel his sense of uncertainty within myself of what do I need to bring into existence on the blinking line of the blank word document? What does this world need from our unique selves? I invite each of us in 2019 to start putting ourselves into that blank document and find God’s calling that makes us come alive. Let’s all give a big thanks to our food pantry volunteers from Wednesday, December 19th: Kathy and Bill F, Christie M, Mara S, Beth S, Linda and Rik L, and Jim D. Many thanks to our faithful volunteers! We had a wonderful and inspiring Christmas Eve service here at First Friends with Vicki W, Sam H and Dave B sharing poetry and Eric B, Savannah B and special guest Paula G sharing beautiful music. Thanks to all that participated and attended. Thank you to Kim H for the photos. · The Young Fellows Program allows recently graduated individuals (up to 29 years old) to work as fulltime members of the FCNL staff for 11 months. Benefits include salary (meets DC living wage standard), healthcare, paid vacation, and sick leave. Fellows will be placed on various teams at FCNL, including legislative, communications, and outreach teams. For more information or to apply, visit https://www.fcnl.org/updates/young-fellows-program-32?utm_campaign=yap&utm_medium=email&utm_source=ak Application deadline for this program is February 18, 2019. · Spring Lobby Weekend is an advocacy event for students happening March 23-26, 2019. This event will include three days of lobby trainings and speakers followed by one day of lobbying on Capitol Hill. This March we will be revisiting our immigration work started at last year’s event, and we are excited to welcome 450 young adults to Washington, DC to tell their stories and make their voices heard! If you have any questions or are interested in recruiting young adults in your area, please contact Larissa@fcnl.org. · Summer Internships are also available! If you are looking for an internship this summer, apply for the Summer Internship program. Deadline is March 29, 2019. Christian Prayer Unity Service ~ At least once a year, Christians are reminded of Jesus’ prayer for his disciples that “they may be one so that the world may believe” (John 17.21). This is an ecumenical service where Christians all over Indianapolis will gather to pray. This year, First Friends Meeting will be hosting the prayer service for Indianapolis on the evening of Sunday, January 20. More details will be released as they become available. We are asking our members and attenders to please donate cookies or snacks for the service—please contact the office at office@indyfriends.org if you can help. Thank you! Thank you for Making 2018 a Success!! Thank you for your support! 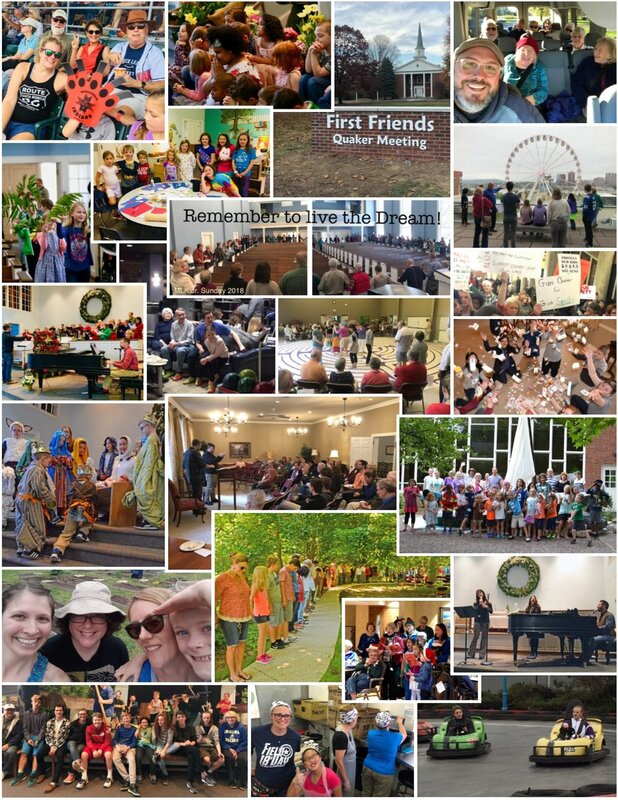 As we look back on all the memories from 2018, First Friends would like to sincerely thank all Friends who supported us. You were able to make the year full of laughter, fun, joy, comfort, peace, reflection, and holiness. Your year-end contributions and pledges made a big difference! If you haven’t made a pledge yet, it’s not too late! You can send in your pledge to the office (mail, or at office@indyfriends.org) or visit our website at www.indyfriends.org, hover over “Attenders” at the top and select “Make a Pledge for 2019”. We couldn’t thrive without you, so thank you for the donations of time, money, and all your support! Let’s make another great year in 2019. Sunday School will resume this Sunday, January 6th! We hope you will join us at 9:00am! Seeking Friends - Bob Henry will lead the group through the rest of Brian McLaren book, We Make the Road by Walking. After we finish that book we will continue the class with another read. Affirmation Class for our youth will resume on Sunday January 13th at 11:00am. Bob will lead the discussion on Quaker Theology. See you there!